No Easy Beads: What's On Your Beading Table? Oh boy! My beading table is a mess! The package of Green Girl swag I won on the bead cruise, several strands of rhyolite, lucite beads and flowers I dyed with alcohol inks, a box full of swaroovski mixed bicones, findings from Jill McKay I bought at B&B two years ago and still have not used, some birds and eggs from Heather Powers, a new bead I purchased from Anne Mitchell for the Greenburg benefit, a pile of Vintaj Natural Brass, several finished Nunn bezels, several spools of C-lon and several strands of czech glass. Oboy -- four birthday bracelets, two necklaces, and a silent auction item I am still trying to figure out . . . . I've been working on some peyote beaded beads... I actually just posted a thread on my blog titled "My Creative Space". If only I had a beading table for all of the stuff I have strewn around my living room! We might be moving some furniture out soon, and then I might have my own table after all - YAY! That being said, I have way too many things sitting around in various laces right now. I'm working on a pattern for my Coronet series so I have half beaded samples out for progress photos. I also have a netted rope half finished because I'm waiting for the beads I ordered to come. I have a bunch of other half finished projects sitting in my lap tray waiting for inspiration. Yikes. Time to clean up! Love what you're working on - can't wait to see a finished product! Love your project and the color is great. 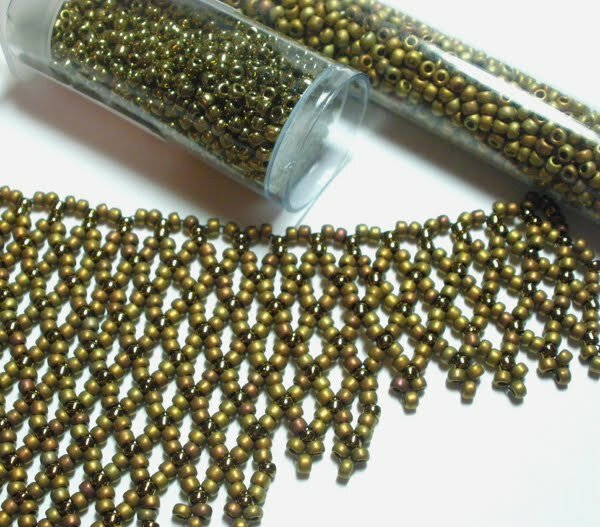 I am working on a bead embroidery collar - tiger eye focal and complimentary color beads for the rest. I only work on one thing at a time and this is a big project. I would like to take an in progress photo today but it is raining and very dreary right now, maybe later. I like what's on your table! My table, all of the tables in my house, are full of beads and pendants, and junk for the SABOS show. What great way to start my day by reading what's on everyone's beading table. P.S. My table is full too. I just moved everything out of the way to take the picture of the bead work I was doing. All I can say is that you are way neater then I am. Although, that looks like a two color piece and may lend itself towards more neatness. Very pretty. Right now, the turquoise freeform peyote bracelet I made last night, a sample for an upcoming class. It sits amongst a pile of turquoise beads waiting for it's toggle to be made. I love knowing how other people work...thanks. I'll post mine on FaceBook - way too neat as I just cleaned house as the AZ dust was critter deep! Hmmm....multiple bracelets and the starts of many new pieces = quite a colorful mess! Very pretty colors in your piece. I have one of those too - almost the same color! A gold & black celini spiral - is it a bracelet or a necklace? Yes. And looming ahead - the Beading for a Cure project. But I don't think I'll be looming with it.